Batter up! And that's just the coating for my MVP Fried Chicken. Are you ready for the Word Series of cheap$kate eats? Just step up to the plate and allow me to pitch some tasty entrees your way, that you can serve up while viewing the Cleveland Indians battle the Chicago Cubs for baseball's 112th edition of Major League Baseball's championship series. Nibble: to pitch along the far edges of the strike zone, around home plate. The Penny Pinch Hitting Chef has a dugout full of recipes for baseball lovers that will leave enough green in your wallet to buy an extra keg of beer for your tailgate party. Just click on any recipe name below to see what I mean. There are no strikeouts in this recipe list! 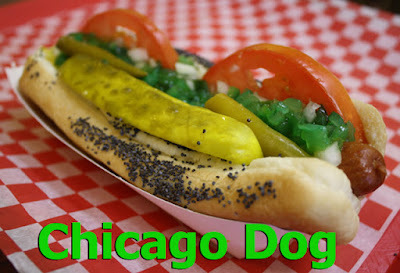 For Cub fans, the Chicago Dog is the grand slam of tube steaks. If you have never had one, you don't know what your missing. High Cheese: A fastball thrown high over the plate. Behold the warm, rosy-red grilled frank topped with mustard, nestled in a black-speckled poppy seed bun, flanked by half wagon wheel slices of tomato, Day-Glo green relish, chopped onion, a wedge of pickle, two sport peppers, and finished with a sprinkle of celery salt. This is the real thing; just looking at it makes me shudder from the winter chill on a blustery, cloudy Chicago day. Now that you have the recipe make your own version using easy-to-get regular pickle relish, just don't tell Cubbie fans or you may get aced with a beanball. Authentic Chicago Dogs can be had here is Los Angeles, too, at the exceptional Fab Hot Dogs in the San Fernando Valley. So all you Windy City transplants will definitely feel at home there. Check out my video below to see how a Chicago Dog is done right. Next to pizza and hotdogs, Fried Chicken is a fan favorite. And I've come up with a crunchy coating that will empty the bleachers and have fans storming the kitchen! Kickoff the World Series with my Fried Chicken Sandwich Recipe or use my special flour and spice mix for regular bone-in chicken parts. My mouthwatering video below is better than an inside-the-park home run. Your boys and girls of summer will take a 7th inning stretch and huddle around your cast iron pot of my fragrant and spicy Chicken & Sausage Jambalaya and Cajun Gumbo. Can of Corn: An easy to catch high fly ball to the outfield. Serve a pitcher's mound size plate of Teriyaki Spam Musubi. Or, set out shredded slow cooked pork, chopped onion and cilantro, with warm tortillas and your favorite salsa, for Mexican Carnitas Tacos. Your food fans will start a wave, from the living room to the kitchen table. For all you Cleveland Indian fans I have the prefect recipe for you, a succulent and smoky BBQ Pulled Pork recipe. I use regular BBQ sauce, but you will want to serve a Buckeye State version with mustard/vinegar/brown sugar sauce for the home team. My Pulled Pork recipe is easy and cheap to make, of course. 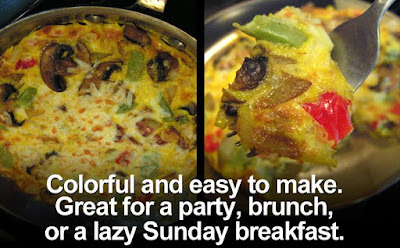 Just check out the video below or click here to see all the tasty recipe details. Cincinnati is known for Chili served on spaghetti or over a hot dog. While I don't have the exact recipe of the chili that is in a Four-way plate (spaghetti, chili, onions, cheddar cheese.) I can point you in the right direction with a generic Homemade Meat and Bean Chili recipe. Just add some extra Greek spices like: a dash of allspice, clove and nutmeg to make Cincinnati-style chili. Set out a bowl of cooked spaghetti with a steaming pot of Cincinnati Chili, and your Chief Wahoo fans will clear the benches for a plateful. Does beer go with Steamed Articokes? Hmmm....you'll have to try out my recipe to find out - do let me know if you try it! If fish is on your mind then hook your bleacher bums with some of my homemade Sushi Recipes. Try tagging out a Spicy Tuna or California Roll. How about setting up a Fielder's choice of chopped veggies and fresh fish and roll your own delicious Hand Rolls? It's easier than you think, and I have simple photo-illustrated instructions a click away, here. While everyone's watching the pre-game show send in any of my delicious dugout sides, including: Bacon Wrapped Dates, Tomato & Basil Bruschetta, Deviled Eggs, Portabella Mushroom Fries, Sweet Fried Plantains, Ceviche with Avocado and Black Beans, and Chicken Satay with Peanut Sauce. Dying Quail: a fly ball weakly hit, that lands in between the infield and the outfield. 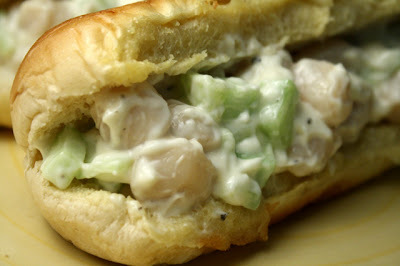 East Coast revelers will eat up my riff on a Lobster Roll -- a cheaper Scallop Roll. And if fans can't make it to Chicago for game day, then throw another log on the fire and gather in front of the big screen with a steaming bowl of my cheap$kate Clam Chowder. Los Angeles locals know an LA Street Dog is a home run. And there will be no need for rain checks when you serve a sandwich plate of gooey, cheesy Patty Melts, hearty Meatball Subs, Homemade Deli Pastrami, Falafel Pitas, and steaming Sloppy Joe's. 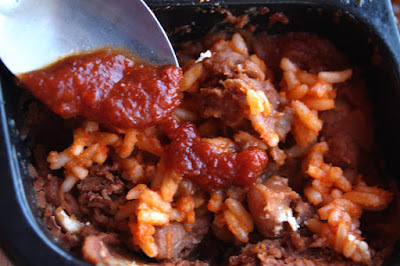 If you're looking for one pot meals, so you don't miss any action on the field of dreams, just check out my Pork Bourguignon, French Cassoulet, Chicken Tinga Stew, Mr. Patti's Red Beans & Rice, Baked Pasta with Cheese and Cauliflower, Baked Lasagna with Ground Chicken, Shepherd's Pie, or Sausage & Sauerkraut with Beer recipes. Looking for a relief pitching recipe? How about a different twist on Buffalo Wings with my African Spiced Water Buffalo Wings? 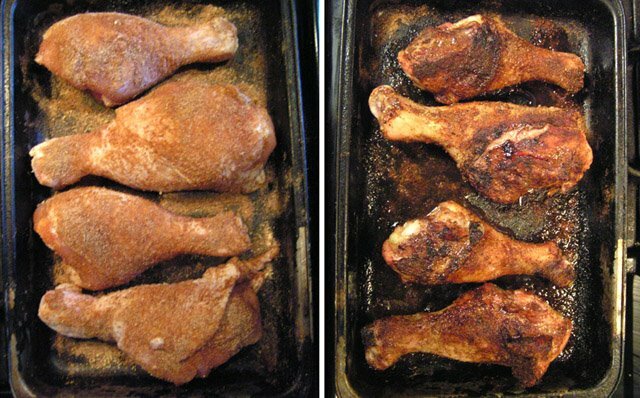 This original recipe features chicken legs, but you can substitute wings. The Cheap$kate Chef's Turkey & Black Beans Chili recipe will add extra points on your scoreboard for flavor. Make it spicy, but be sure to have an ice chest full of brews for all your bench-warming guests. Set the Table: getting runners on base, ahead of a power hitter. 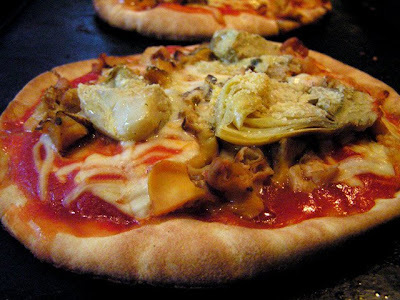 And don't forget to send in from this Whisk Welding Culinary Coach a most versatile of plated plays, the Pita Pizza -- a varied list of toppings you can use would fill the coaches chalkboard. Tired of stale, soggy stadium hot dogs? 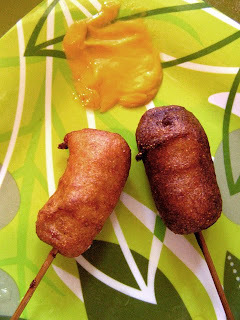 I have a great and easy Corn Dog Recipe made with Vienna sausages -- but you can use regular wieners. There will be no foul balls as your hungry guests dip these crunchy coated pig skins into my tasty honey-mustard sauce. So dig deep into my bullpin and click on any of the tasty treat names above to watch an instant reply of recipes from my blog. Your guest will be cheering you on -- from their cheap seats! Rhubarb: a bench-clearing baseball brawl. Bigger is not always better, and my latest Deal of the Day is proof is in the pudding. Weighing in at one pound and 3 ounces, Saltillo Enchilada Dinner is one hot mess of a gut busting Mexican-style entree. I guess I got my money's worth for 99.99 cents (okay one dollar) from my local 99c only Store, but I ended up paying the price of a sour taste and a bit of queasiness upon finishing the defrosted meal -- and an hour later I had a belching attack. Now, first off this meal ticked me off visually. Since I've worked in the advertising field a bit, a pet peeve of mine is when the cover art or photo is way different than the unwrapped real meal. Just compare the box above to the plate below. 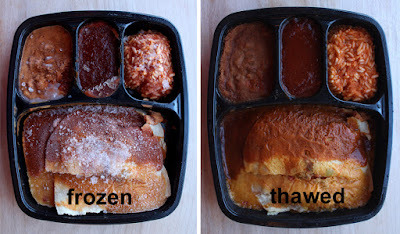 The cover shows 4 individual enchiladas side-by-side, but what I got were two stacks of sauce-covered tortillas - one side had Cheese Enchiladas and the other was Beef Enchiladas. It was like eating an enchilada lasagna, which would be fine if that was what I thought I was purchasing. The good news is the Cheese Enchiladas in Chile Con Quesos were okay, kinda like eating enchiladas covered in queso (Tex-Mex cheese) from a can - a guilty pleasure at best. The cooked corn tortillas had a little texture but the taste is typical Mexican fast food bland. 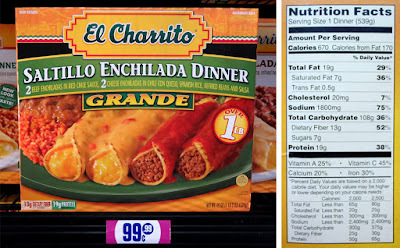 The biggest ripoff were the Beef Enchiladas. 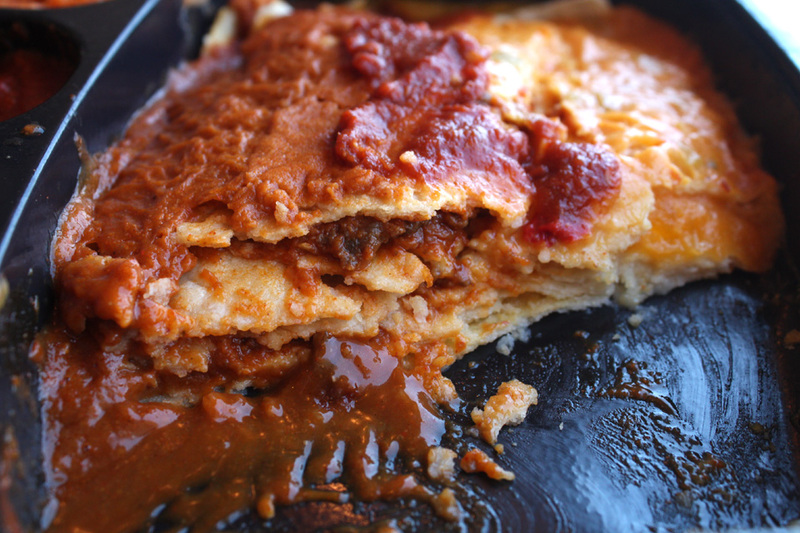 For 2 enchiladas, there might have been a tablespoon of meat, total. And who knows what kind of meat it was? They put the meat under the first layer of tortilla, then it was mostly tortilla from then on - probably 4 layers worth, with a tiny bit of enchilada sauce smeared in. The red enchilada sauce was fiery and chile intense. That's okay with me, but may be too much for sensitive palates. As for the sides of beans and rice, they were okay. 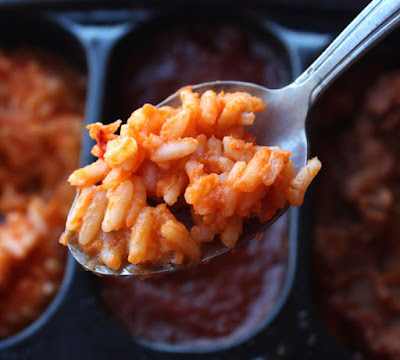 The rice was sauced with tomato like Mexican Rice should be, and still a little firm after microwaving. 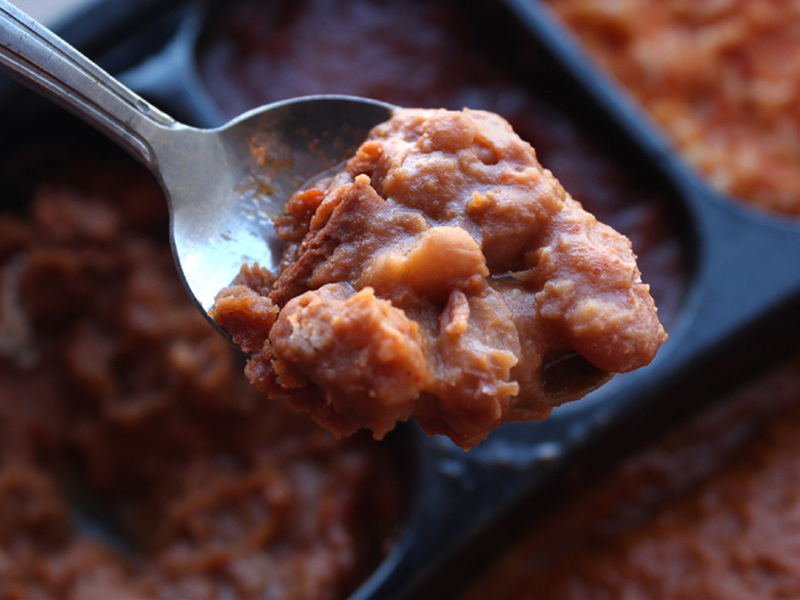 The pinto beans had some texture too - not refried and mush like most cheap Mexican frozen meals. There was an extra slot for salsa too. It was a spicy mix of chile sauce. It went well with the beans and rice. I added most of the salsa to the beef enchiladas, as they were the most dry. The ingredients list is extra-long, even for regular frozen fare. Man, I needed a cleanse after this meal. It's a big meal, but in this case not a good deal. 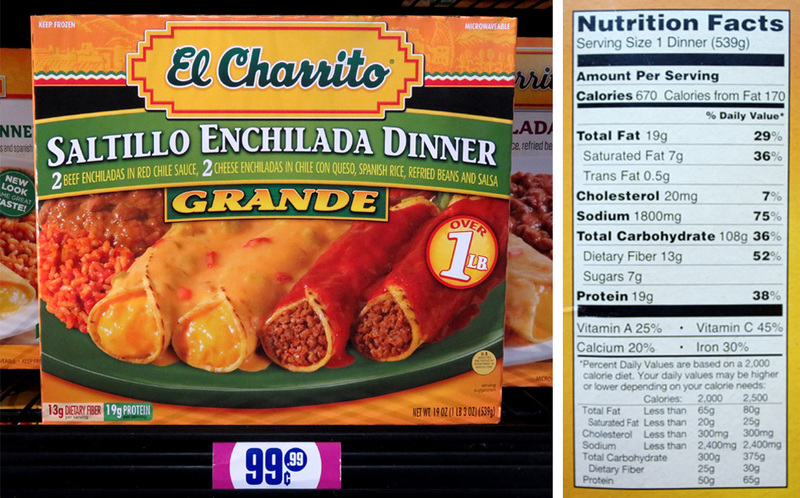 So on the 99 Cent Chef's Cheap$kate Dining Scale of 1 to 9, 9 being best, I give Saltillo Enchilada Dinner by El Charrito a 3. 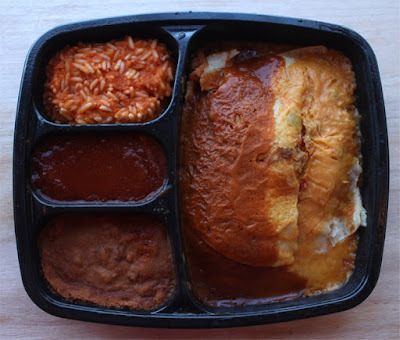 I reviewed Cheese Enchiladas in Chile Con Queso for a buck a few years ago. Check it out by clicking here to see my Cheap$kate Dining review. One of my favorite veggie side dishes to order in an India restaurant is Saag Paneer, a pungent, creamy spinach and cheese dish. A Middle Eastern style cheese from India, called paneer, is presented in deep fried cubes floating in slow cooked curry spiced spinach. 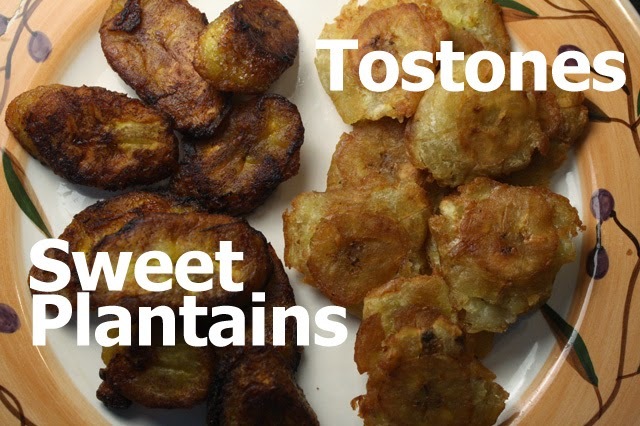 My latest video recipe is an easy version to make, so read on to see for yourself. 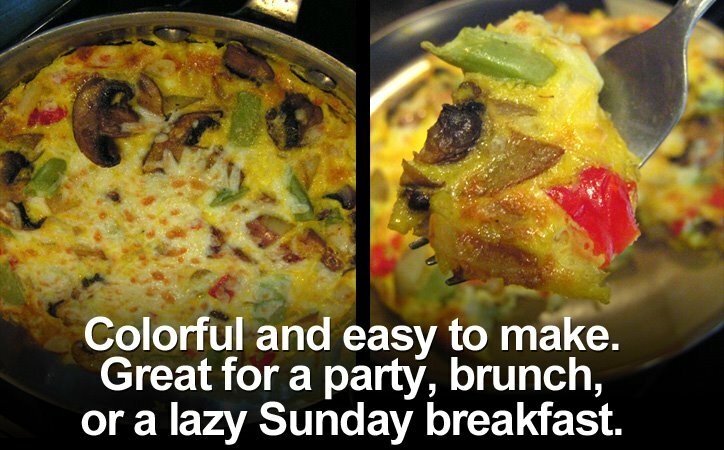 Unfortunately, it's not a light dish when served in your local India lunch buffet line. Clarified butter and deep fried cheese adds too many calories for this weight-watching kitchen commando. Plus, it is not easy to find the India cheese called paneer. Paneer is a hard white cheese, that is similar in texture to feta cheese, but milder in taste. 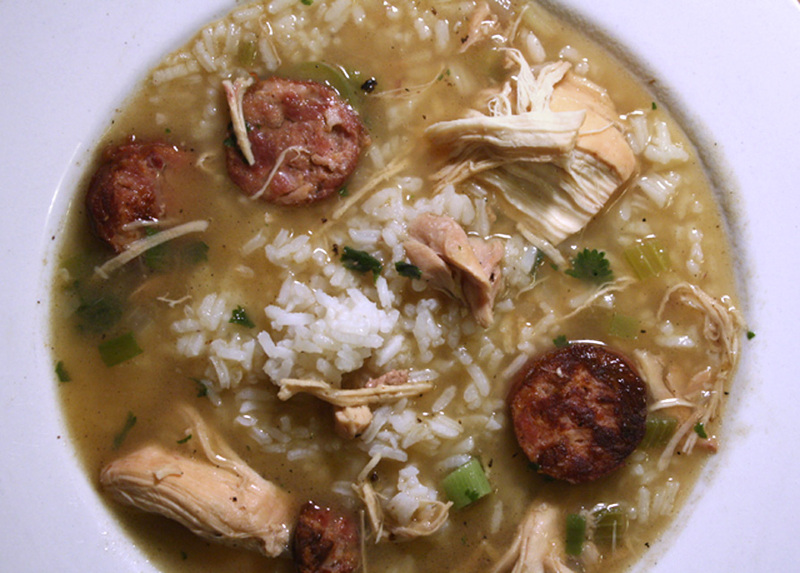 Because of a high melting point, it softens but still holds it's shape, even in a stew. But, upon doing a little experimenting, I found Mexican Queso Fresco cheese has a similar flavor, and holds up well to slow cooking, too. And for a lighter creamy taste I have added a small amount of cottage cheese. So I put two and two together and came up with a budget-busting, calorie-skimping, entree anyone can make. My latest video recipe, Saag Paneer, combines the best of two culinary worlds, Mexican and Indian. The main spice is curry powder. 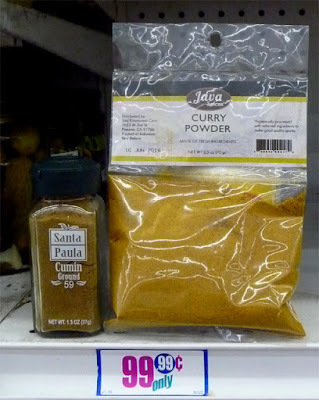 I just use cumin - open a jar and smell -- it makes up 75% of your typical curry powder. 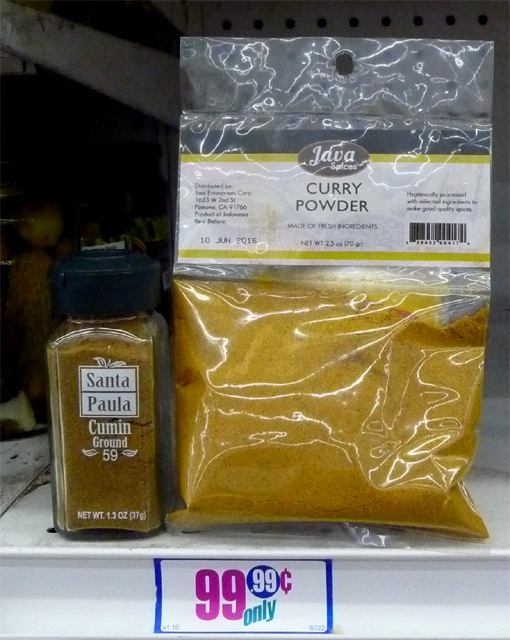 And cumin is much easier to find on any grocery store spice shelf; plus it's much cheaper than curry powder. Pick up an onion to saute, as this will add a bit of caramelized sweetness. For an extra boost of cheesiness crumble-in half a disc of Mexican cheese called Queso Fresco, that comes cheaply from 99c only Stores and Latin markets (It's showing up in regular groceries, too.) 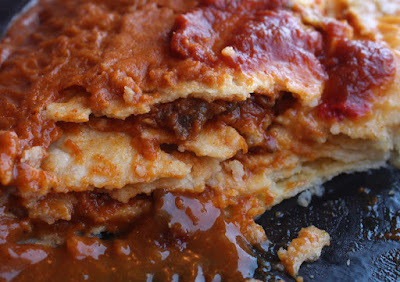 I also use Queso Fresco for the Mexican breakfast classic, Huevos Rancheros - just click here to see that recipe video. Of course, my Saag Paneer recipe is adjustable to suit your convenience. It is just as tasty without Queso Fresco cheese. Think of this recipe as an India version of typical American Cream Spinach, with a little added curry spice. 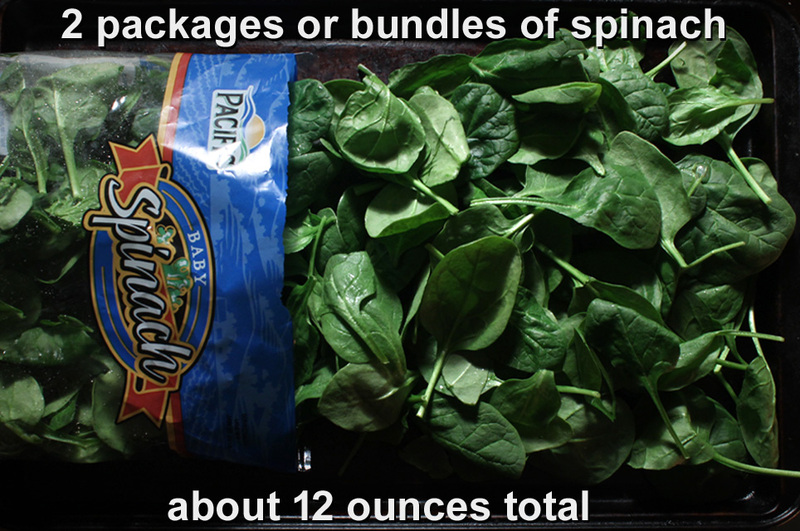 Spinach is still a reasonable price and I can get fresh bundles of spinach and cleaned 5 or 6 ounce bags for a buck, or less. Fresh spinach may have dirt, so give it a rinse first. It may also have part of the root and long stems that need removing.. You can leave shorter stems, they will soften enough. 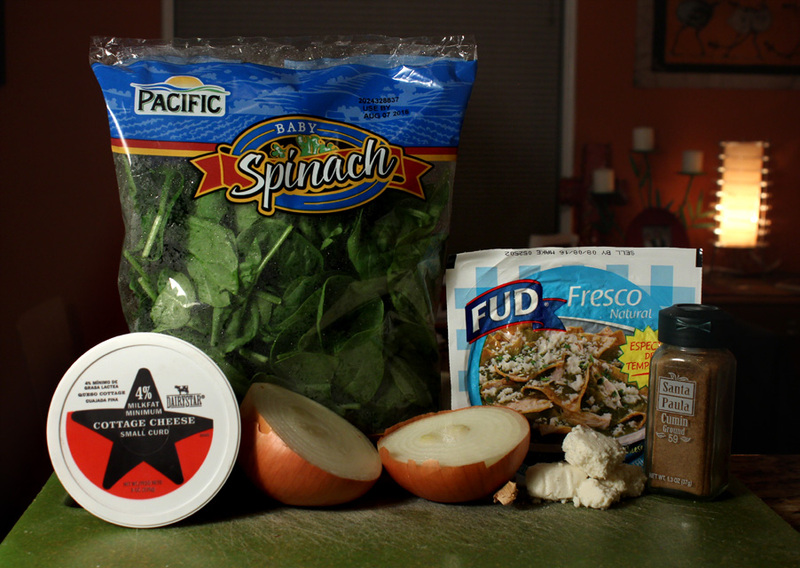 Slow cooking the spinach and cottage cheese with cumin creates a lush dish that is low in calories, especially if you use low fat cottage cheese. So give my delish, India-inspired, Mexican-style Saag Paneer a try -- all it takes is a little spinach and onion chopping with some slow cooking. Play it here, video runs 2 minutes, 3 seconds. 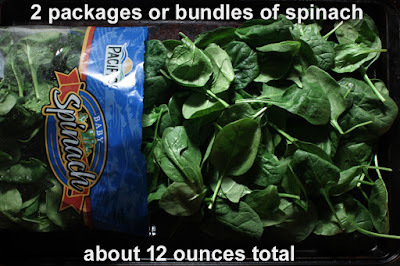 2 bunches of spinach - or about two 6 ounce packages. 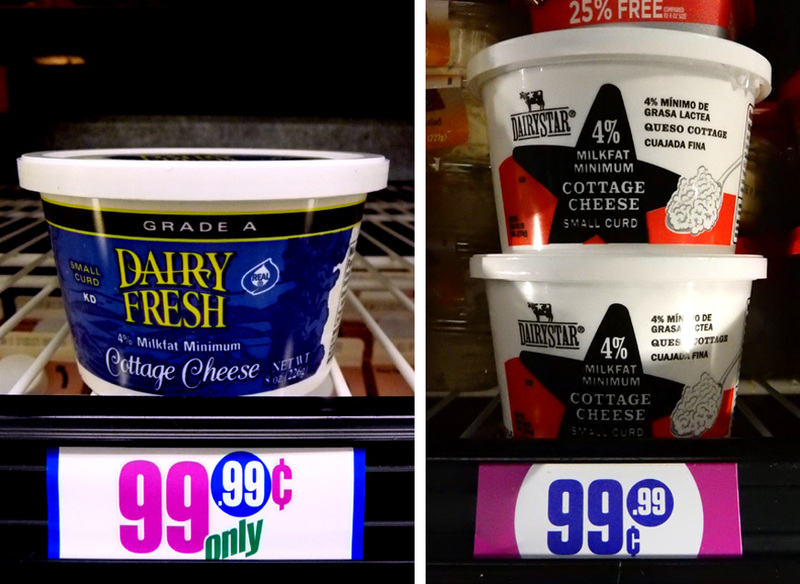 Cottage Cheese - about 8 ounces. Okay to add more to suit taste. I used low fat. Mexican Queso Fresco cheese - optional. I used about half a 5 ounce package, roughly crumbled. 1 teaspoon ground cumin - if you have curry powder, use that. 1 tablespoon oil - for sauteing onions. 2 tablespoons of milk - if needed during final cooking stage. Pepper to taste - I find there is plenty of salt in cottage cheese and Queso Fresco cheese. Queso Fresco cheese - optional. I used half a 4 ounce package, that is broken into bite-sized pieces. You can use more if you like. Heat oil in medium-sized pan or pot. 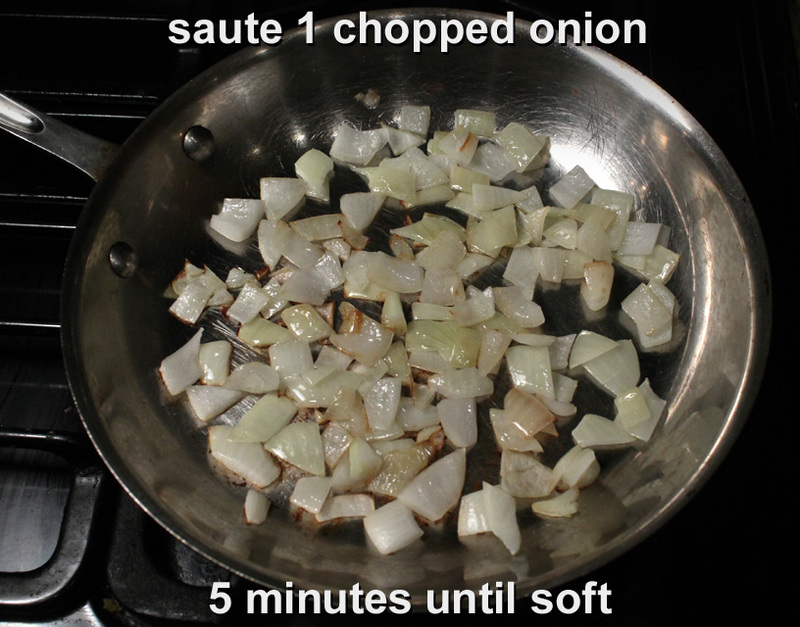 Add chopped onion and saute until soft, about 5 minutes over a medium heat. Mix in cumin and saute for a couple of minutes. Add cottage cheese and mix well. Start adding chopped spinach. It will cook down in a minute or so. Continue cleaning spinach (if needed) and adding it to pot or pan until it is well blended into cottage cheese/onion mixture. Once all the spinach is added, you can pile on some Mexican Queso Fresco cheese. Season with pepper, reduce heat to low and cover to cook for 20 - 30 minutes until it is like Creamed Spinach. 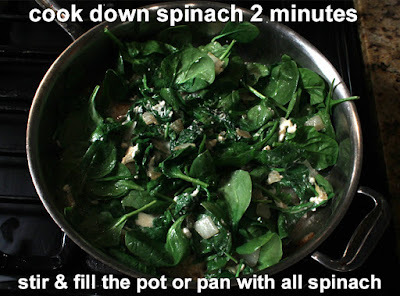 Check spinach mixture from time to time to make sure liquid does not completely cook out. Stir periodically. The Queso Fresco will soften but still retain it's shape. 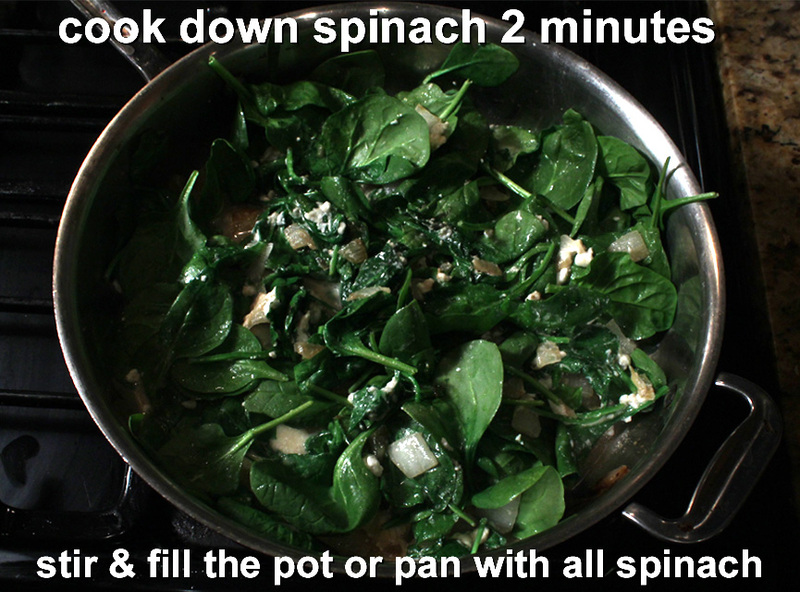 As spinach cooks down it adds a lot of liquid. The object is to cook spinach until very soft and cream-like. 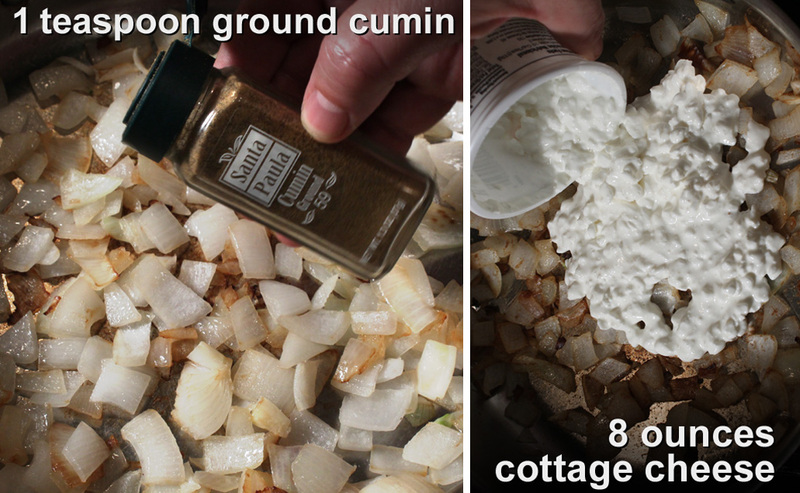 The cottage cheese will partially dissolve into the sauce. Add a couple of spoonfuls of milk if it starts to dry out. 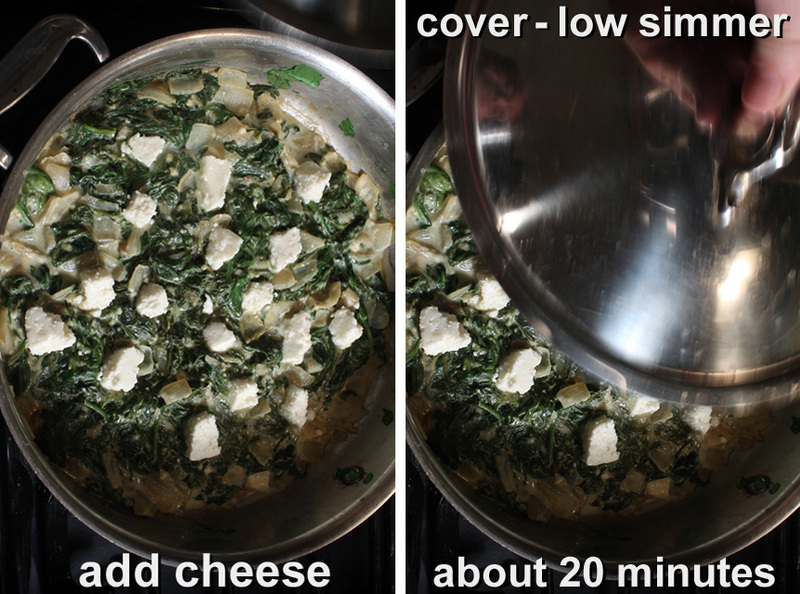 If you like Saag Paneer more creamy then just add a 1/4 cup of milk or cream during last 20 minutes of simmering. This would make a delicious pairing with my African Spiced Water Buffalo Wings, Chicken Satay with Peanut Sauce, and Coconut Rice. 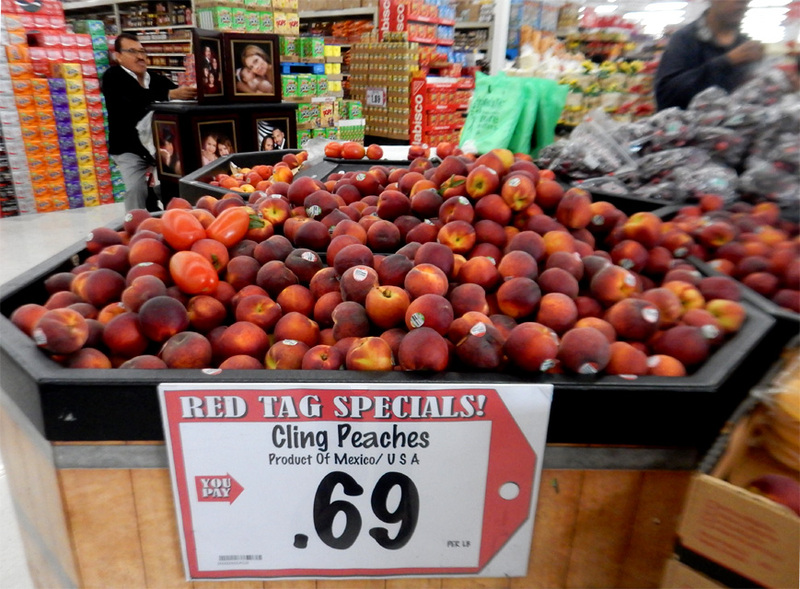 Peach are not only for pies, it makes a great salsa, too. This refreshing recipe combines the best of two worlds, sweet peaches from the South and spicy jalapeño from Mexico. I've made all kinds of salsas from scratch, just click on any name to view: tangy Roasted Salsa Verde (tomatillo,) Red Chili (2 dried types - but same recipe,) Pico de Gallo, and Mango Salsa. I leave the skin on my fruit, but you can remove it if you like. But do make sure the peach is a ripe one. 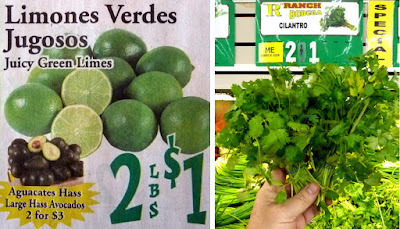 My local Latin market carries them for less than a dollar per pound, and if you live in the Georgia, then you know where (and when) to get them for sure. I used fresh jalapeño, but you can use it from a jar as well. The jalapenos will have a vinegar taste, but that's okay, just drain them first. 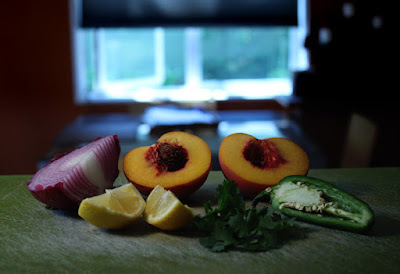 I also remove the jalapeño seeds, but you can leave them in for a fiery Peach Salsa. The other ingredients come cheaply and are easy to get. 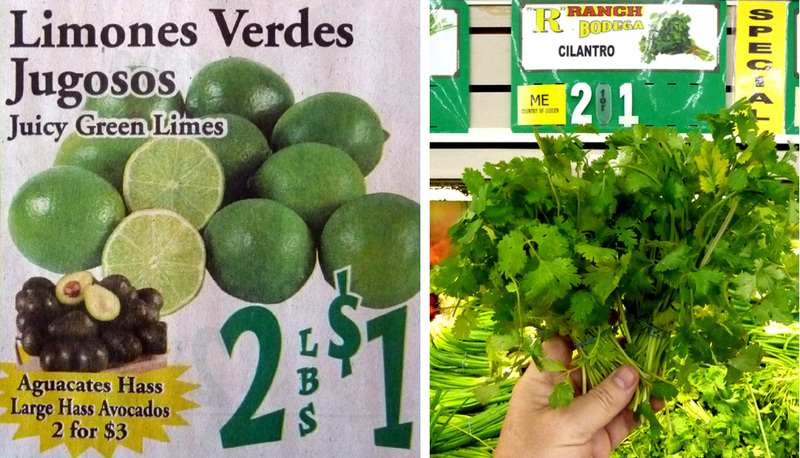 Cilantro is now carried by most groceries these days. I used red onion, but you can use cheaper white or yellow onion. For my last taco party I set out a bowl of Peach Salsa and regular Red Chili Salsa. Guess which one vanished first - yep, it was the Peach Salsa. For a fresh take on traditional tomato-based or red chili salsas, give my Peach Salsa a taste. All it takes is a little chopping. 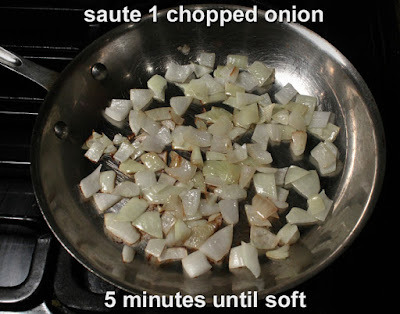 3/4 cup onion - chopped. I used a red onion, but okay to use white or yellow onion. Lemon or lime juice - I used the juice of one whole lemon. May need more juice depending on ripeness of fruit. Okay to use juice from a jar, about a tablespoon. 2 tablespoons cilantro - chopped. Okay to add more or less to taste. 1 tablespoon chopped jalapeño - optional. Okay to use jalapeño from the jar. I removed seeds, but leave them in for extra spicy. Okay to use more or less to you spice level. Use ripe peaches. Prepare peach by cutting around peach and pulling it apart to remove the seed. 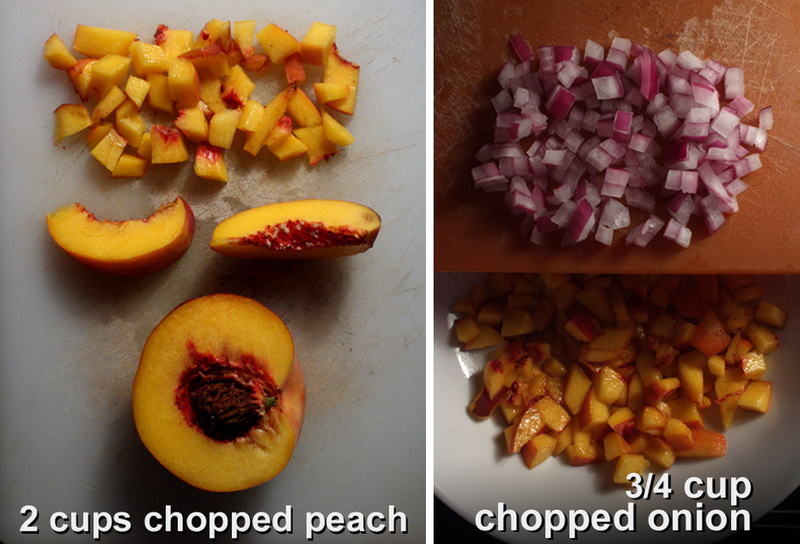 Slice and chop peach into small pieces, like you would for a tomato based salsa. I left the skin on the peach, but you can remove some or all the skin. 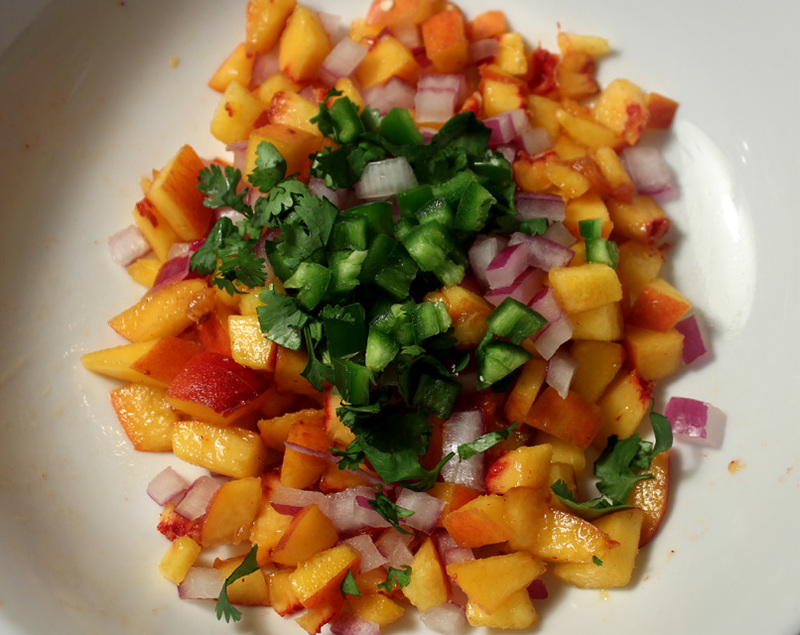 If your cutting board has any peach juice left, just pour it into the salsa bowl. 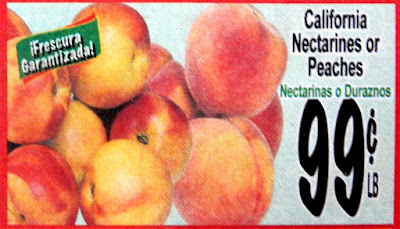 Add chopped peaches to a bowl. Chop the onion into small pieces. I used about a quarter of a large red onion. You can add more or less onion to taste. 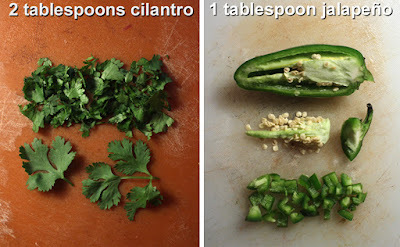 Chop enough cilantro leaves to fill 2 tablespoons. Okay to add more or less to taste. Add cilantro and onion to the bowl with peaches. Squeeze in the juice of one lemon or lime. Normally lime is used for a salsa, but I used what I had on hand. Okay to use juice from the jar or plastic. A good trick to get you lemon or lime extra juicy is to slice it in half, then microwave it for about 10-20 seconds until warm. This will release more juice. 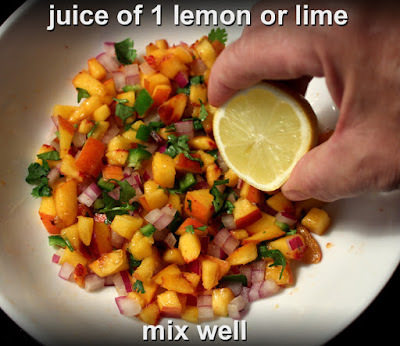 Mix fruit, cilantro and onion with the lemon or lime juice. Finally add the chopped jalapeño. When handling jalapeño make sure not to touch your eyes or lips or you will get burned. Be sure to wash your hands with soap after working with a jalapeño. The oil from a jalapeño is very hot to delicate body parts! I like to slice the jalapeño lengthwise to cut out the white pith and remove the seeds. Discard the stem. 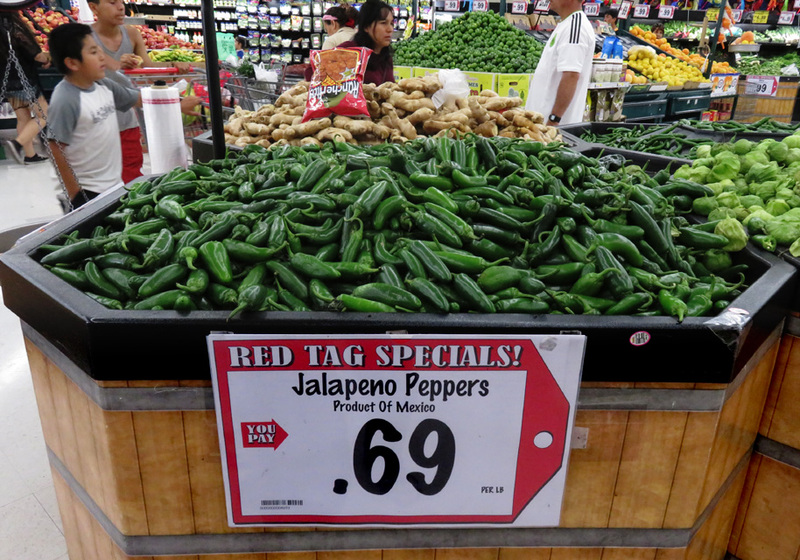 You will have a little spiciness from jalapeno flesh, but not as much as when adding the seeds. I used about a quarter of a large jalapeño, or about a tablespoon when chopped. If you like your salsa hotter then add more chopped jalapeno, or add jalapeño with the seeds. If you are unsure about how much you spiciness you can take, just add a little chopped jalapeño at a time and mix, then try salsa. 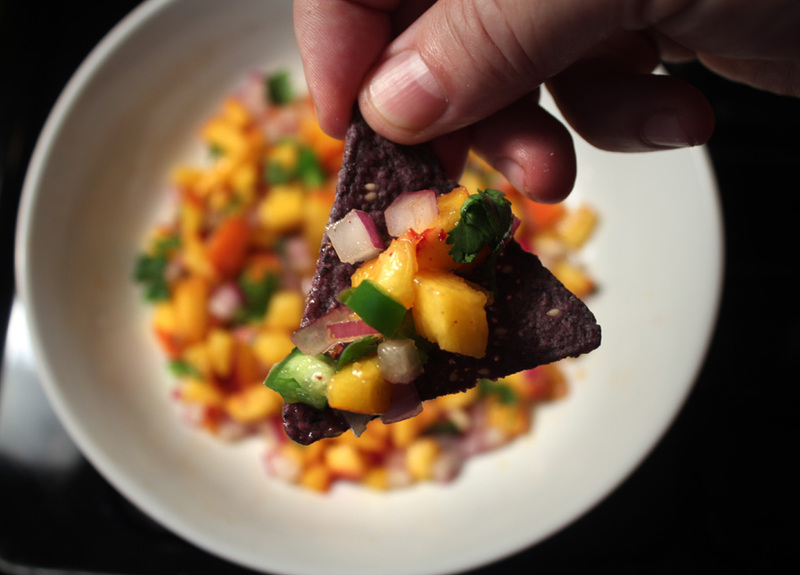 Finally give your Peach Salsa a final mix to incorporate all the jalapeño. Serve with chips, on a taco or in a burrito. This recipe is easy to double or quadruple for more guests. You can adjust the ingredients to suit your taste - add more peach or less jalapeño; more cilantro or even leave out the onion.